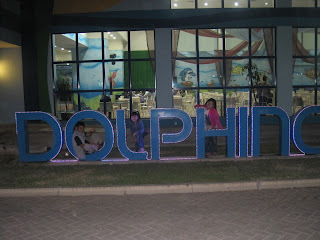 The weekend after Mama came back from Ahmedabad (Oct30-sat), Papa brought us to the Dubai Dolphinarium. Location : Dubai Creek Park. 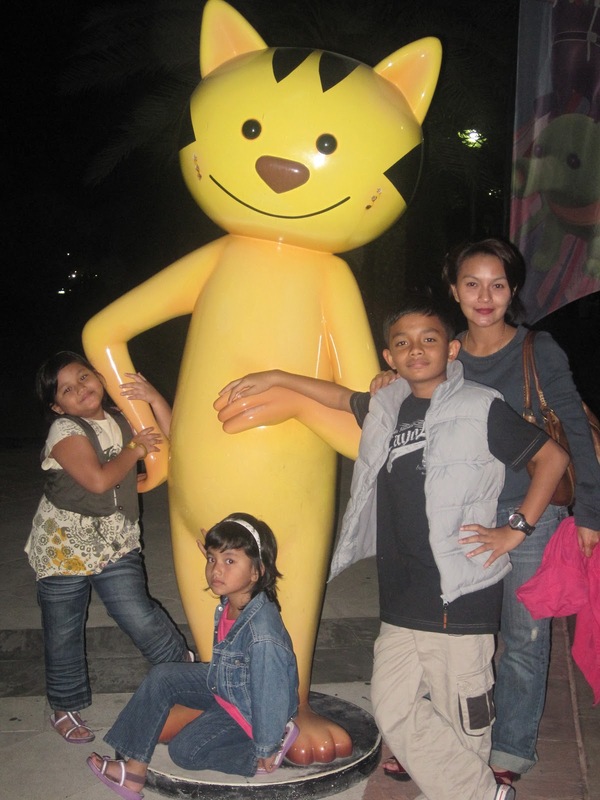 To enter the park itself, kena pay DHS 5 each (the thing about Dubai, all the ticket prices in most places, are the same of Adults & Children). We were a bit late bcoz of traffic, and also bcoz on the way Papa stopped at Beach Centre, nak buy baju school Viya, Dede & Abang yang dah rosak sikit sbb Papa rendam campur skali ngan seluar. 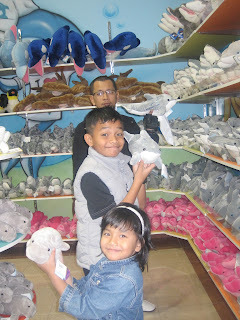 Anyway, Mama blanje tengok Dolphine Show tu. Around DHS 350 (after 20% discount) sbb Mama pakai local credit card. 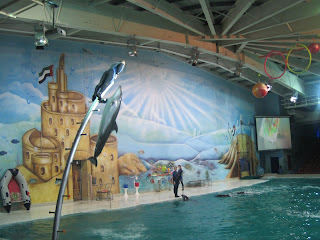 Best juge sbb Dolphin dia BIGGG... and can jump HIGH!! 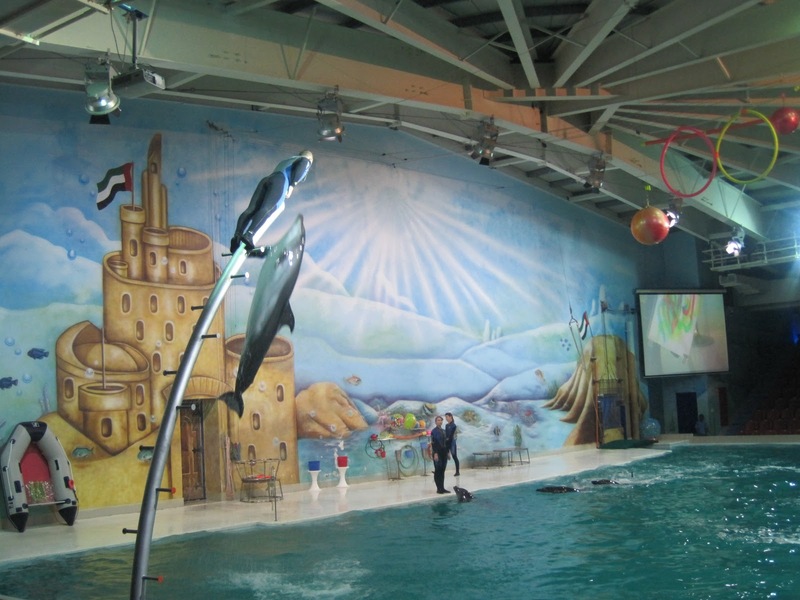 Before Dolphin came out, there were quite a few of other shows like Seal, Acrobatics etc. After the show, we went out and just enjoyed the park..
At the Creek Park, there is also other attractions. 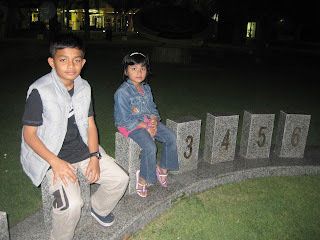 The one I remember is the ancient clock i.e how to determine the time of the day pakai penanda batu & arah matahari. 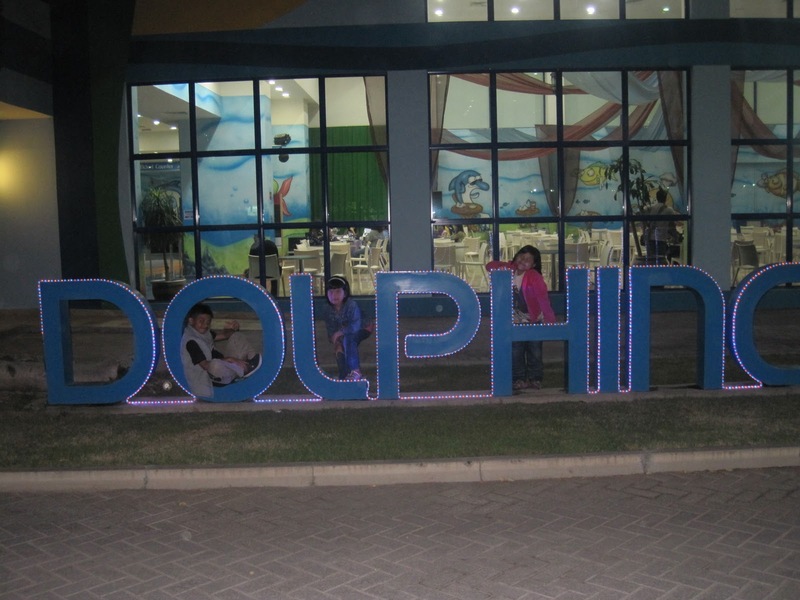 And there's also a CHILDREN's CITY, but by the time the Dolphin show was over, the place was also closing, so tak dapat masuk. This picture was taken at the entrance of the Children's City, mascot dia ... ngiau, ngiau! Then, we headed home.. sebab the next day nak school.. On the way, Papa dropped by at one restaurant called ZAINA (on Wasl Road, behind UnionCo-op) , makan 'nasi mandi', majlis style. Takde pinggan, makan ramai2 dalam dulang, and duduk bersila atas lantai..
And this is Dede... meditating @ sleeping ? 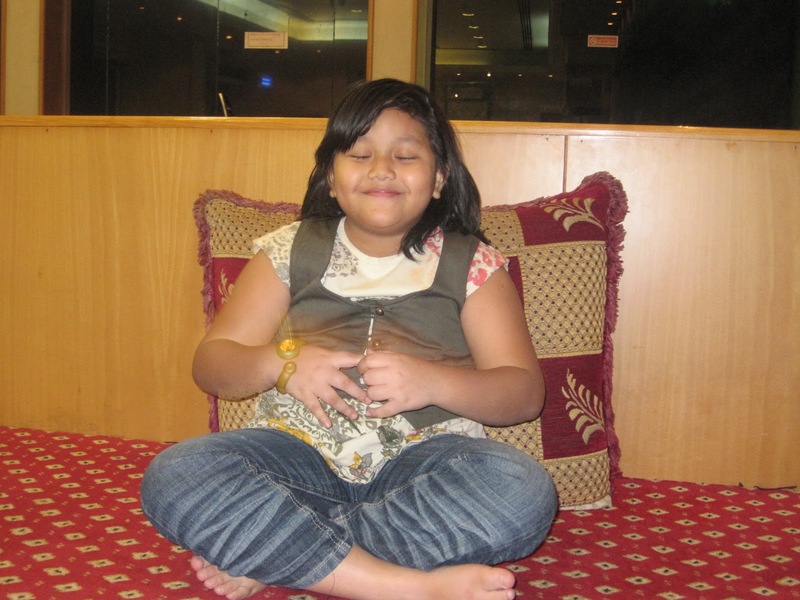 while waiting for the food (hungry) @ dah kenyang? ?